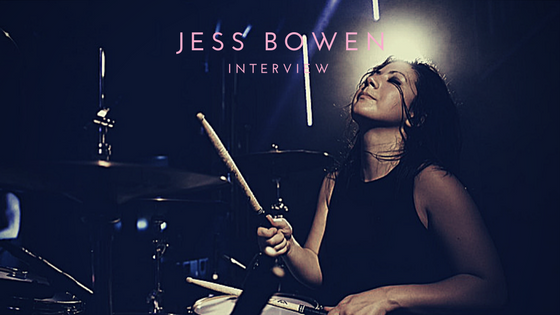 The Summer Set’s Jess Bowen has added a lot to her resume since the band released their latest full-length, Stories for Monday. Their radio single, “Figure Me Out” made it to SiriusXM top 40 radio, their promo tour of a themed jean jacket successfully made its way across major cities to promote the song of the same name and their Made For You tour dates were hand selected by their fans. In between all of that, they also played a number of dates on the 2016 Vans Warped Tour. While The Summer Set only played on the tour for about two weeks, Bowen was out there for just about a month. She was still drumming, of course, but with her friends in 3OH!3. Both bands toured together in 2013 and after reconnecting at a Bernie Sanders rally, a joke of Bowen playing with them that summer turned into the real deal. The schedule worked out perfectly so that Bowen only had two Warped Tour dates that she played for both 3OH!3 and The Summer Set. The biggest difference between playing for The Summer Set and 3OH!3 was that this was her first time playing with an electronic drum pad. Although she was familiar with them, seeing friends play them and actually playing them herself were two different concepts. 3OH!3’s 30-minute set included a mashup of 11 songs and was definitely a challenge for Bowen. Learning a new set list as well as transitions and a new instrument was difficult to say the least. On top of all of that, Bowen was also part of a performance for the Alternative Press Music Awards. Bowen, former The Word Alive drummer Luke Holland and August Burns Red drummer Matt Greiner created a marching performance an hour before the ceremony and changed the routine right before they took the stage. “They’re the best guys, amazing drummers; I respect them so much. I shouldn’t have even been in that lineup… I was really happy with the way it turned out,” she said. Bowen didn’t always want to be a drummer, despite that being her father’s instrument of choice. She originally asked for a guitar, which her dad said she could have if she learned drums first. 15 years later and she is still guitar-less but for all the right reasons. “I’ve been playing since I was 11, and obviously year by year I feel more confident in my abilities to play and it really is just growing with your instrument,” she said. She’s been playing with the guys of The Summer Set since 8th grade, honing in on her skills and practicing immensely. She’s gone on major tours and been a part of major deals. But through it all, her biggest lesson learned has been to stay humble. She’s seen and met other industry professionals that have impressed her with their genuine humbleness and she continues to believe that it is a quality worth maintaining. Bowen may be in the back starting a fight, according to Stories for Monday track “All In”, but she’s also in the front maintaining a respectful attitude.